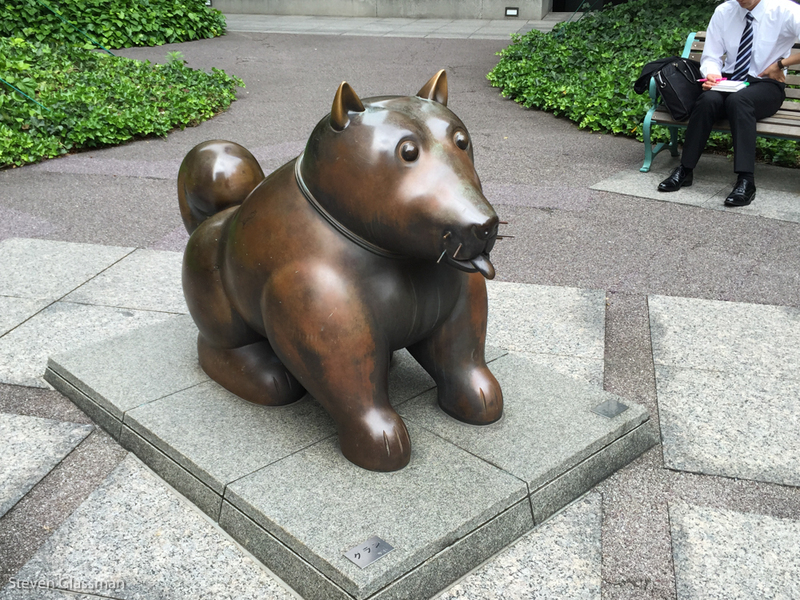 Around the office, Tokyo Edition – Sunshine. Whimsy. Tacos. 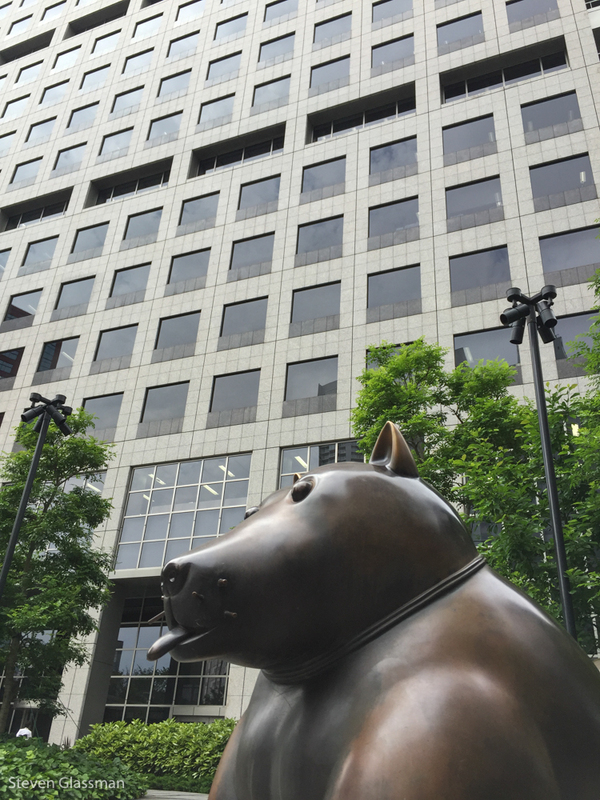 Our office is in the Otemachi financial district. There are lots of very, very tall buildings here. 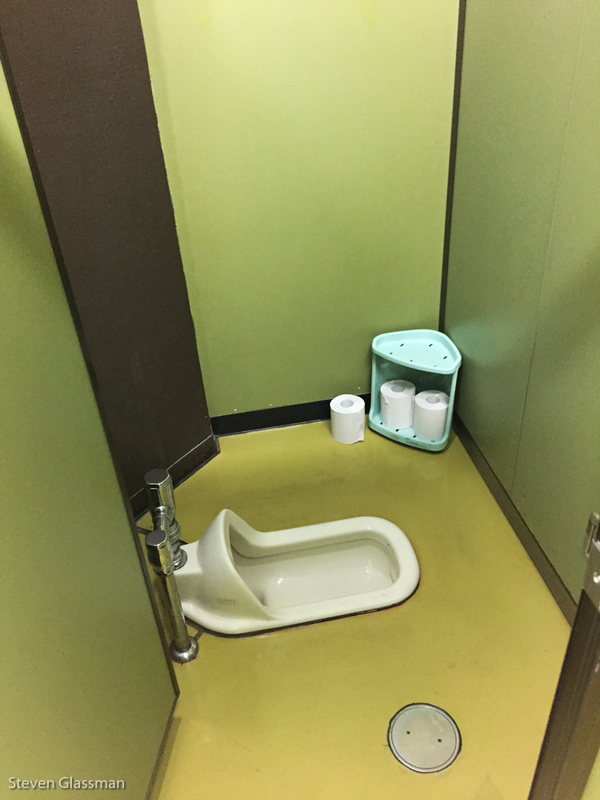 Any series of posts about being in Japan should touch on the older style of floor-toilets. This is what they look like. In train stations, there are markings on the stall doors to tell you whether you have a floor toilet or a Western-style toilet. I managed to go through most of my five weeks in Japan without having to use one of these logistically crazy floor squatters. I was doing fine, until I got to a train station on the outskirts of Osaka. When you’ve gotta go, you’ve gotta go. The problem with floor toilets for a Westerner like me, is that there’s no easy way to balance over the thing unless you take one leg entirely out of your jeans. Even with partial disrobing, I had to rest a tiny part of my weight on the lip of the raised portion. I’m just not built that way. Don’t even get me started about how much taking my shoes off in a public restroom squicks me out. I can tick the floor-squat toilet experience off my bucket list now. I don’t ever need to do that again. This pop-up beer garden showed up near the office, but I never got a chance to stop in. 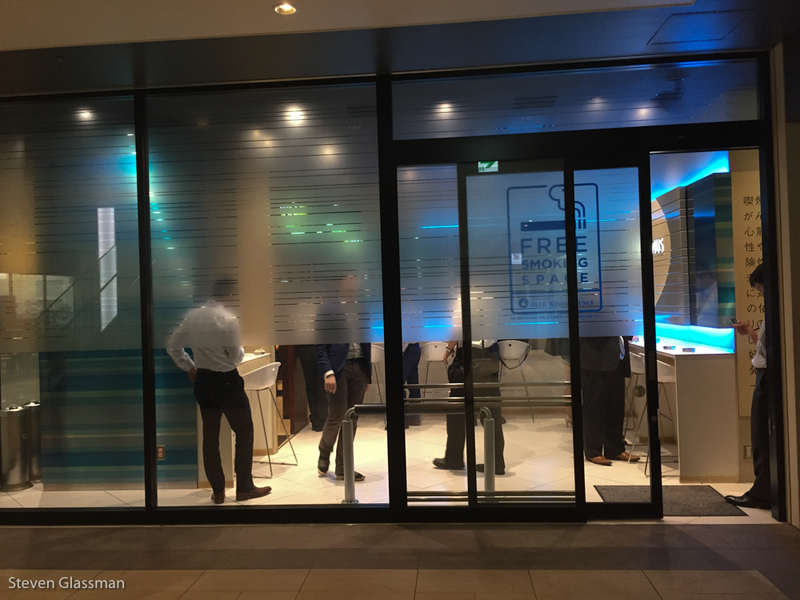 I also didn’t ever see people inside until my very last week. 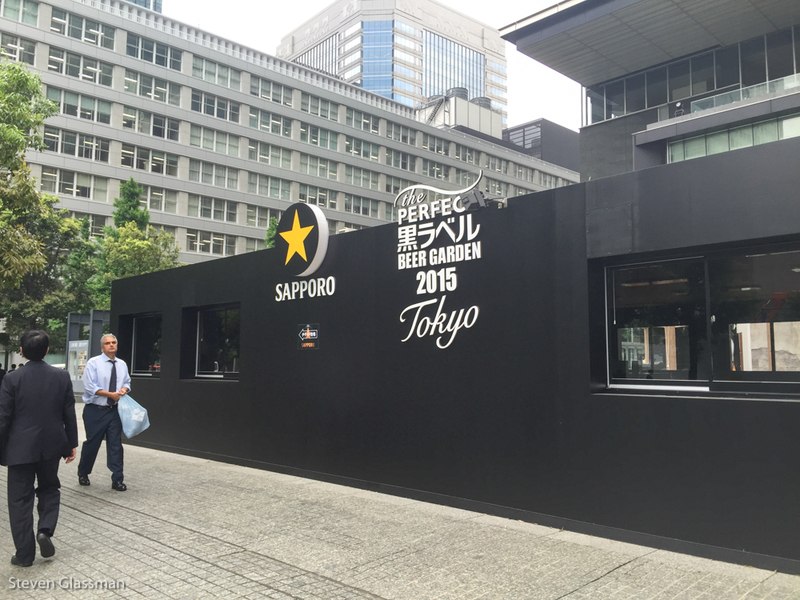 Sapporo is pretty tasty though, so I’m sure that woulda been tasty good fun. One of the buildings near the office has a traditional smoker’s aquarium. These never fail to make me laugh. The ventilation system is top notch, though- I walked past this thing almost every day, and I never smelled smoke from inside. 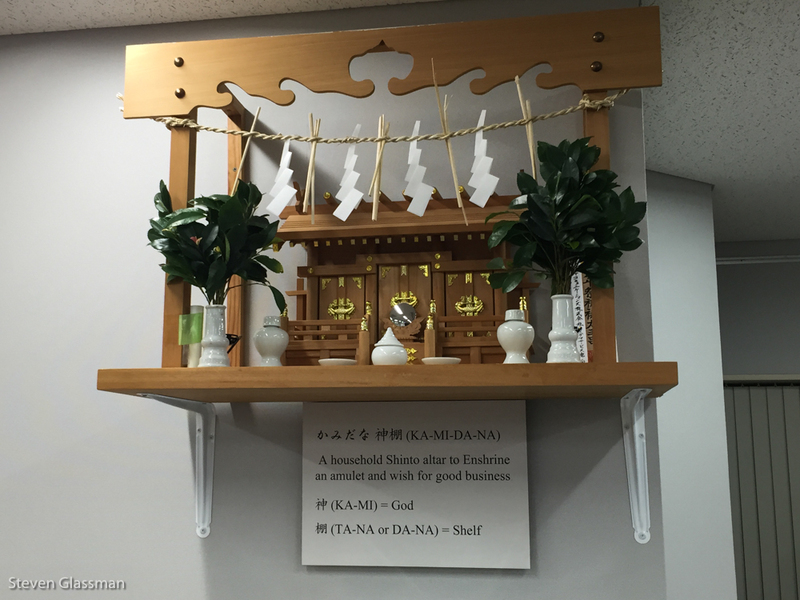 Inside the office, there’s a Shinto altar to wish for good business, complete with an English explanation. I thought this was fascinating. 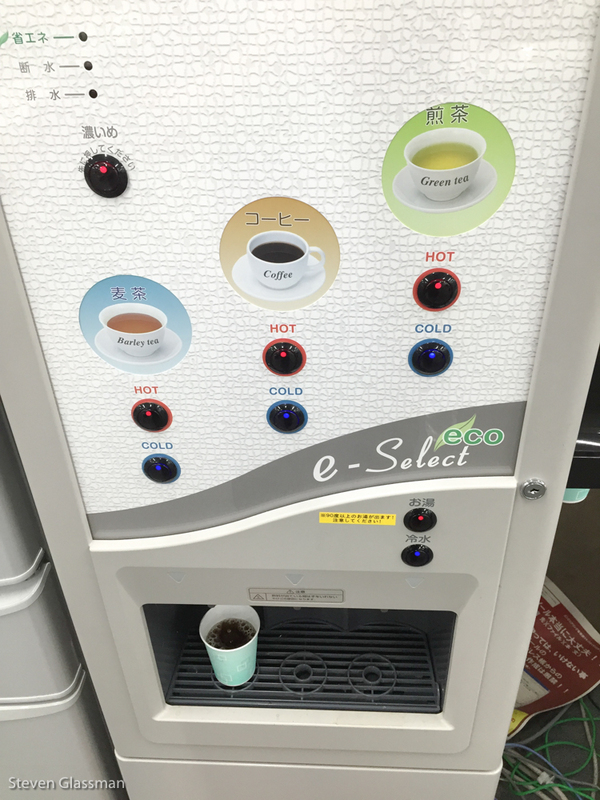 Also in the office: Complimentary hot and cold running water, green tea, barley tea, and (terrible) coffee. I had a cup of the hot barley tea nearly every day- I had never been exposed to barley tea before this trip, and I really enjoyed it. 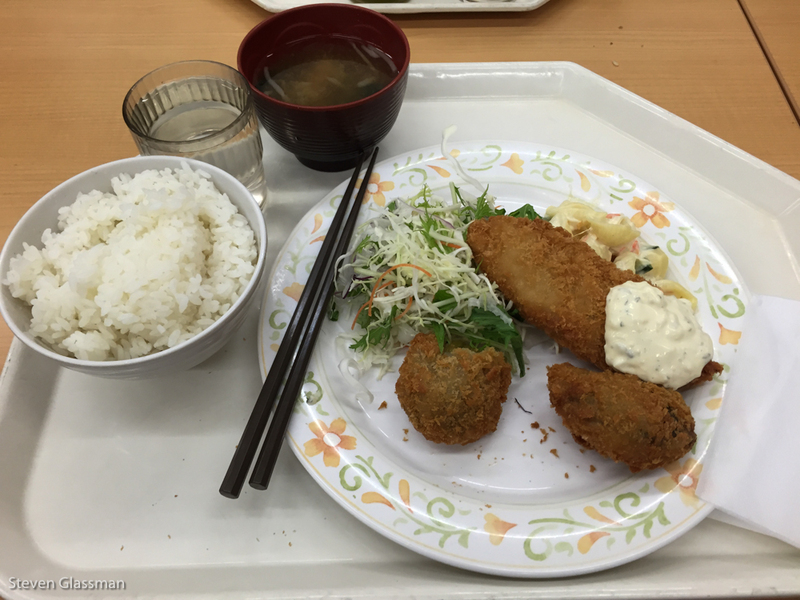 On days that I was in the office during normal business hours, we usually ate lunch in the cafeteria at the basement level. 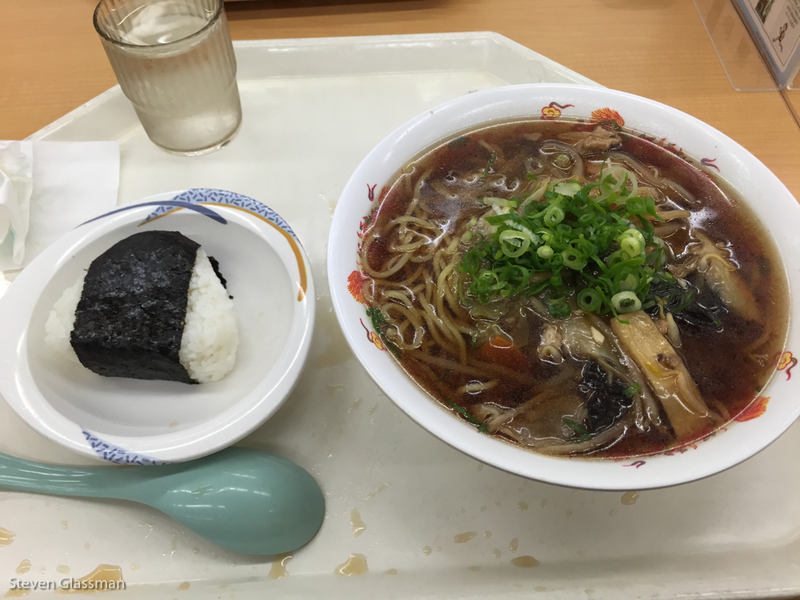 The value is excellent- I usually got a tremendous amount of food for no more than about five Yen. 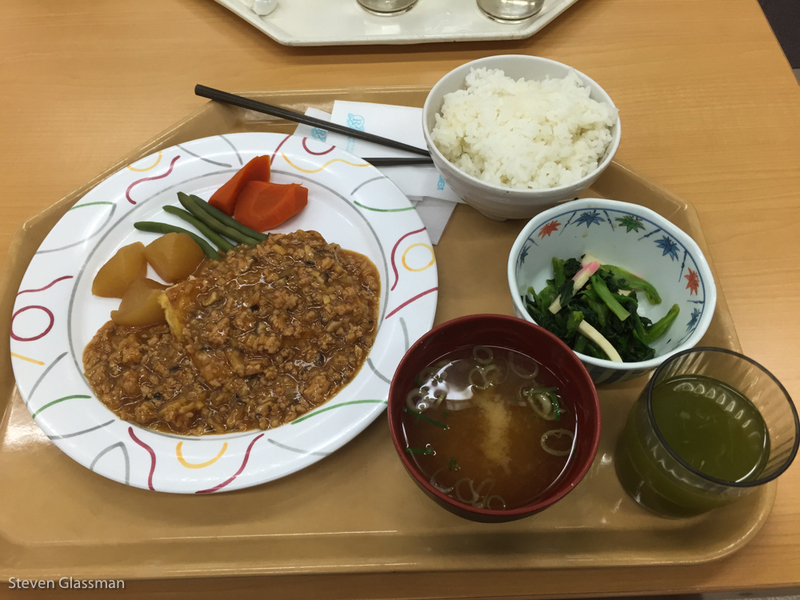 For example, this meat dish, with rice, vegetable, miso soup, and a beverage was 4.90 yen. Similarly this plate with what I thought was three chicken nugget type things. Imagine my surprise when the third one turned out to be fish instead of chicken! I can’t really remember what this one was, but it seems to be a basic noodle-meat-veggie dish. The little pasta salad at the bottom was tasty. This one was a sort of pho-like noodle bowl, with a rice piece that had a seaweed wrap. 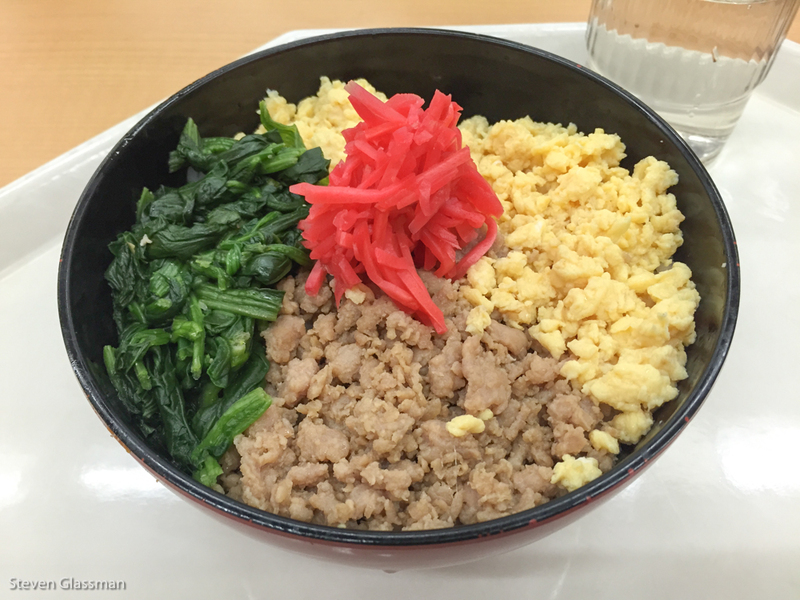 Of all the cafeteria dishes I had, this one was my absolute favorite- I love eggs like crazy, and the other parts were delicious, including the rice hidden beneath the top layer. This is the only dish that I completely finished- most of the others had some leftover food when I was done. 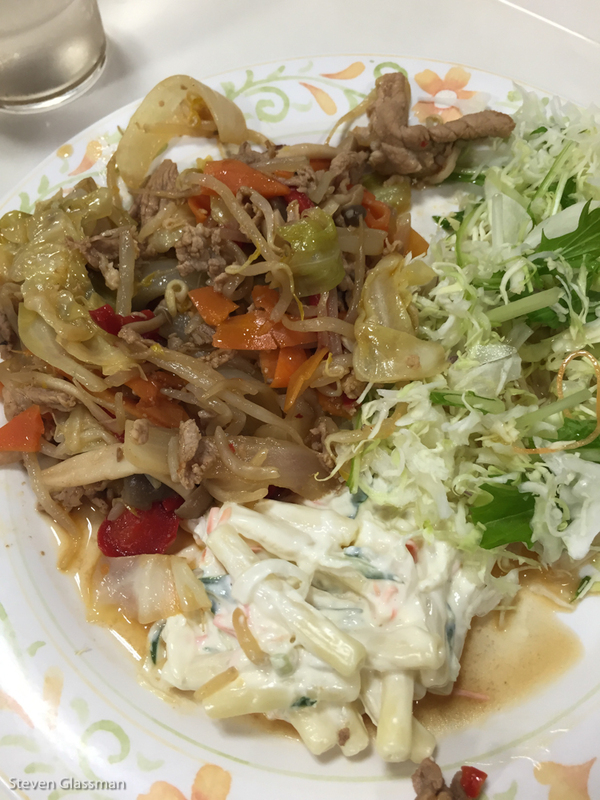 I noticed that my colleagues from the Tokyo office did not have this problem- they all ate significantly faster than me, and they all cleared their plates entirely. I suspect there’s a cultural thing where not clearing your plate is seen as wasting food, but I have to stop eating when I’m full or I feel absolutely terrible. Most of my time in the office was evening shifts, which meant that my food breaks had to use restaurants in the immediate vicinity. 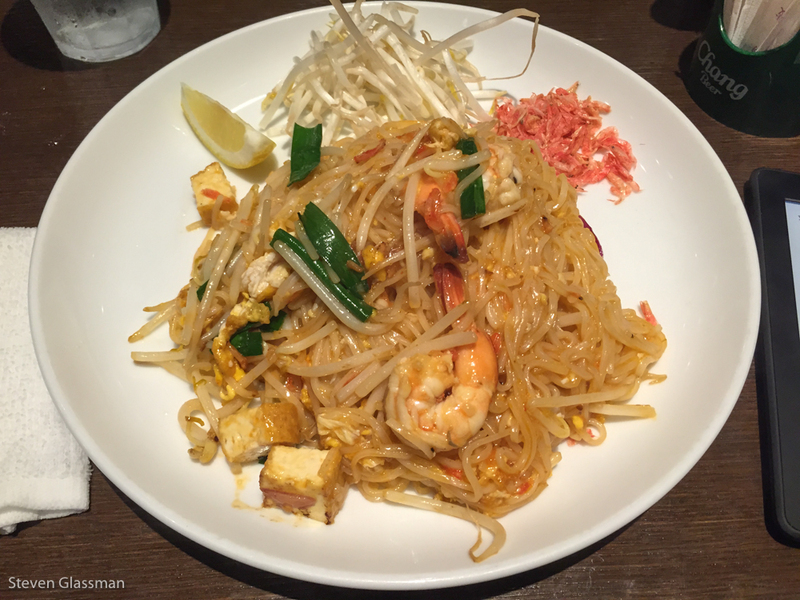 Near the office, I found a delicious Thai resturant, for some great Pad Thai. There’s also any number of Italian restaurants. 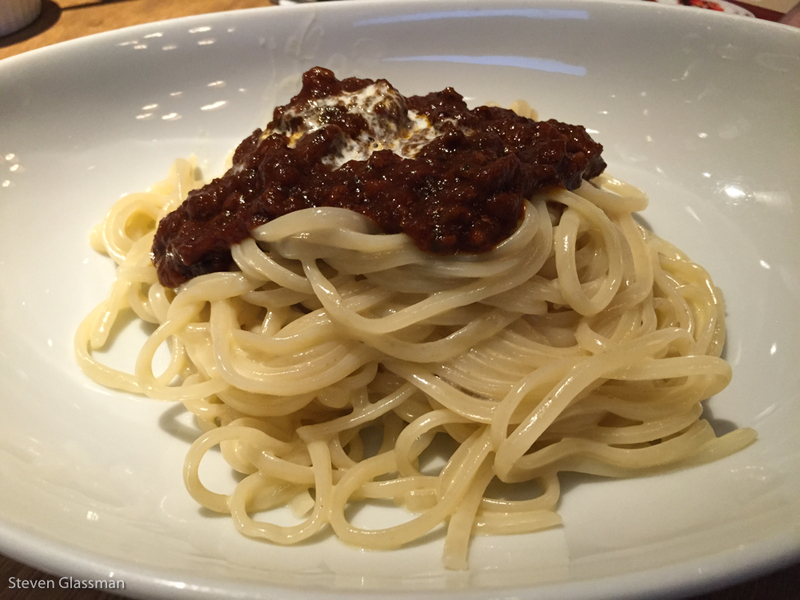 This one in the Otemachi Financial Center has pasta over a stunningly delicious meat sauce. 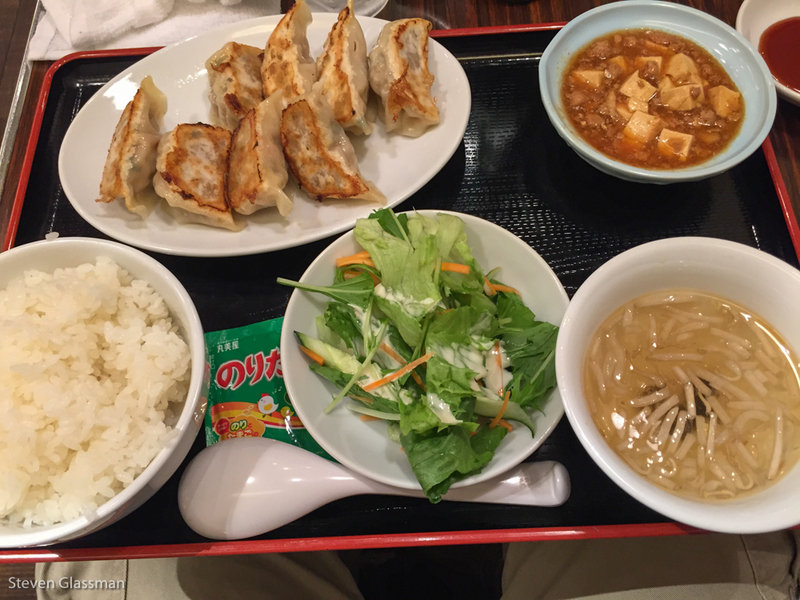 That same food court area contains a Gyoza (dumpling) shop named New York New York. They were one of the few restaurants I visited which had an English menu, even if the translation might need a little bit of work. 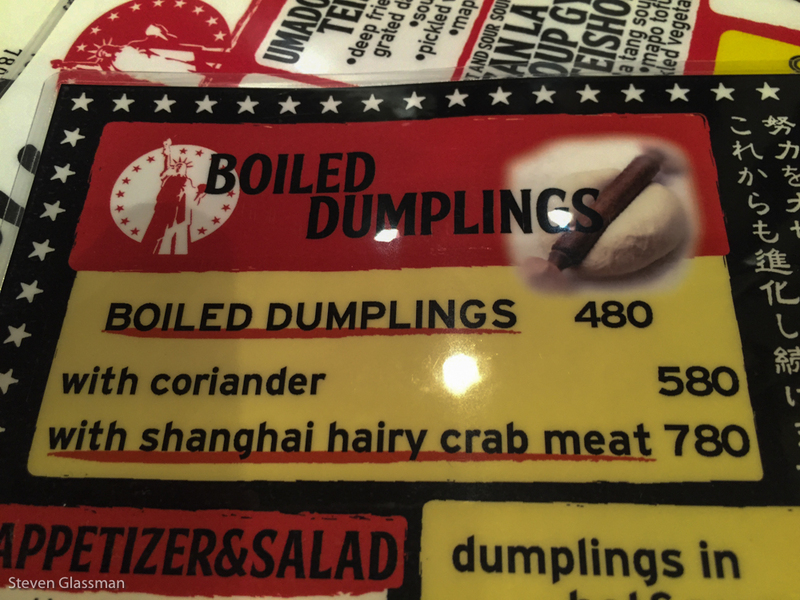 What the hell is hairy crab meat?! Gyoza are damned tasty, don’t you think? My colleague liked this flavor packet quite a lot. 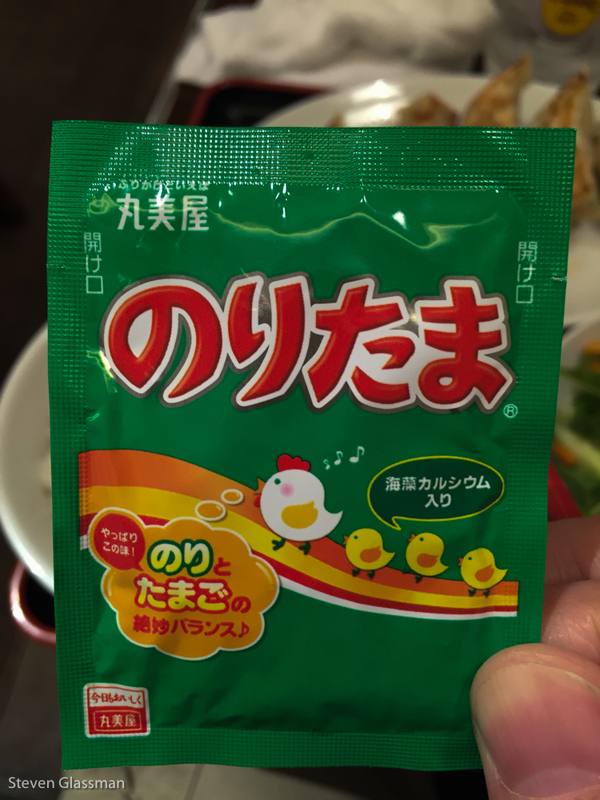 I tried it on my rice, and was disturbed to learn that it tasted like miso and seaweed, not like chicken. New York New York had a fun little photo opportunity. 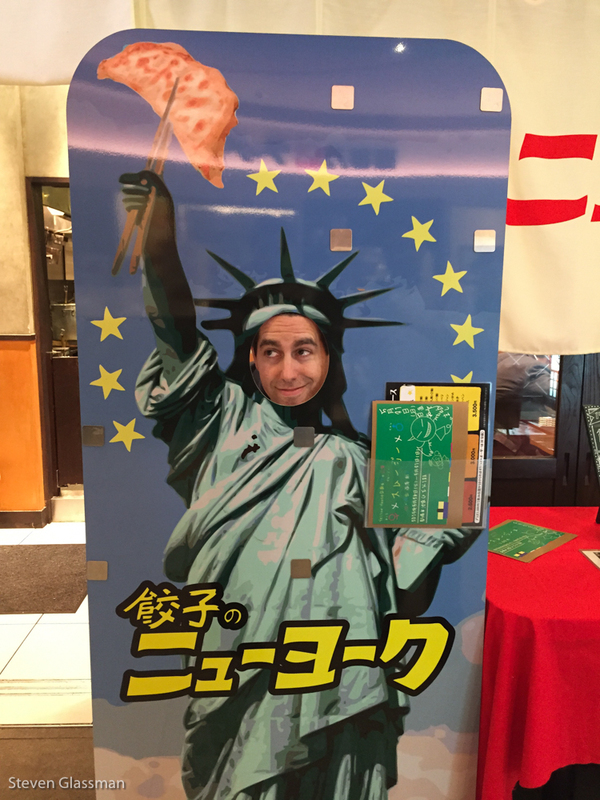 Yup, the Statue of Liberty has chopsticks holding a Gyoza. Why not? This is actually ramen noodles. 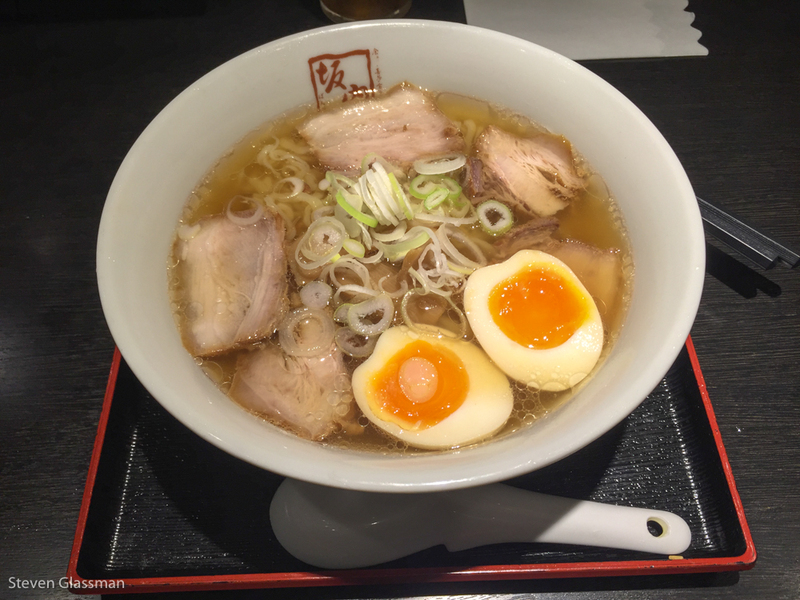 Everything I thought I knew about ramen was challenged in Japan, because the ramen there is amazing and flavorful and nothing whatsoever like the freeze-dried instant noodles I was familiar with. This dish tasted fantastic. Sometimes, after a few days of unfamiliar (and often unidentifiable) food, it’s nice to just have something familiar. Most of the places I ate alone involved a lot of pointing to get the desired food. Subway had helpful visual choices, so it was more or less the same assembly-line approach to food that I was used to. 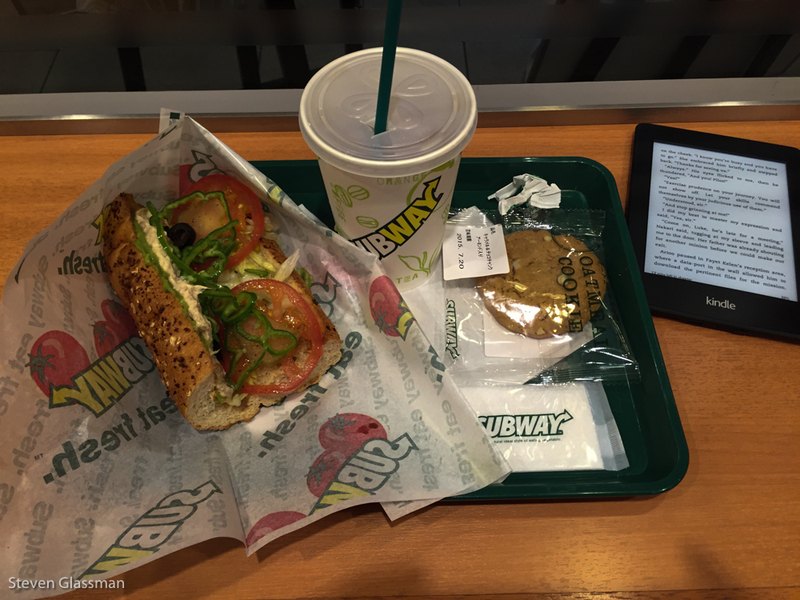 This is a tuna-fish sub with a cookie and soft-drink. This was almost identical to the meal I periodically ate in German Subway restaurants for the last few years. Subway really doesn’t change that much from continent to continent. That’s enough food for right now, though. Let’s take a little detour to meet this adorable pup, a little dog named Gran. Gran keeps watch over the Granpark building, which is where we had to go once during my trip for a meeting. The highlight of taking this meeting at Granpark was this pretty spectacular view from the eleventh floor. 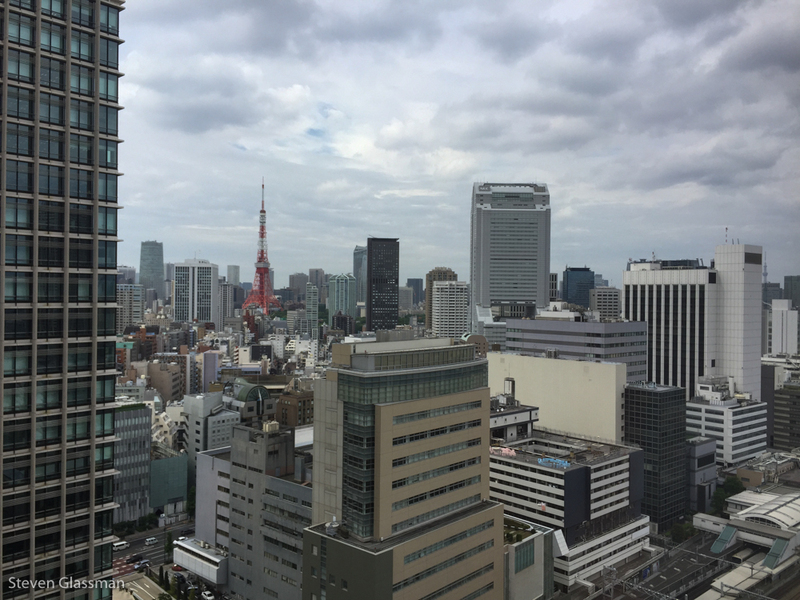 Once more, you can see Tokyo Tower in the distance. I promise I’ll get back to that in another post. This was another fun moment- when we were on our way out, the building was having some sort of earthquake drill. There’s a school in the vicinity, and all the children had been dressed in these little yellow hoods. I’m not positive of their function, but if I had to guess, I would say that the hoods are to provide padding and protection in case an earthquake generates falling masonry. 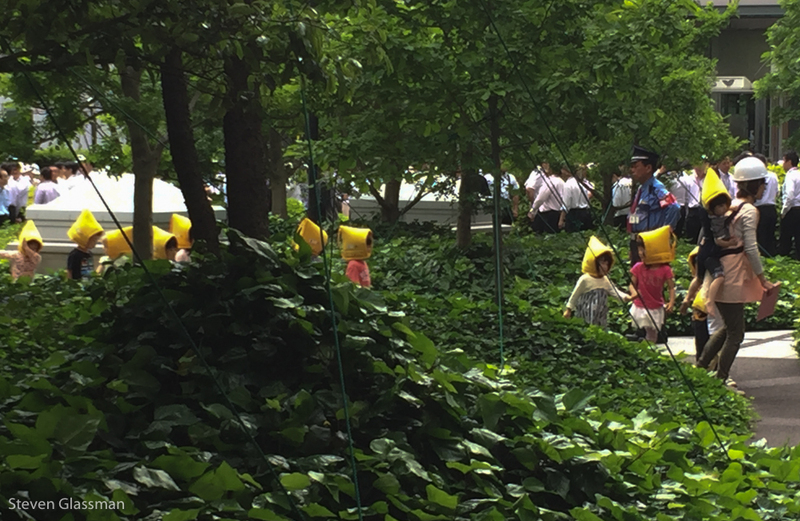 Either that, or the children are all being trained to stand in for garden gnomes in their off time. 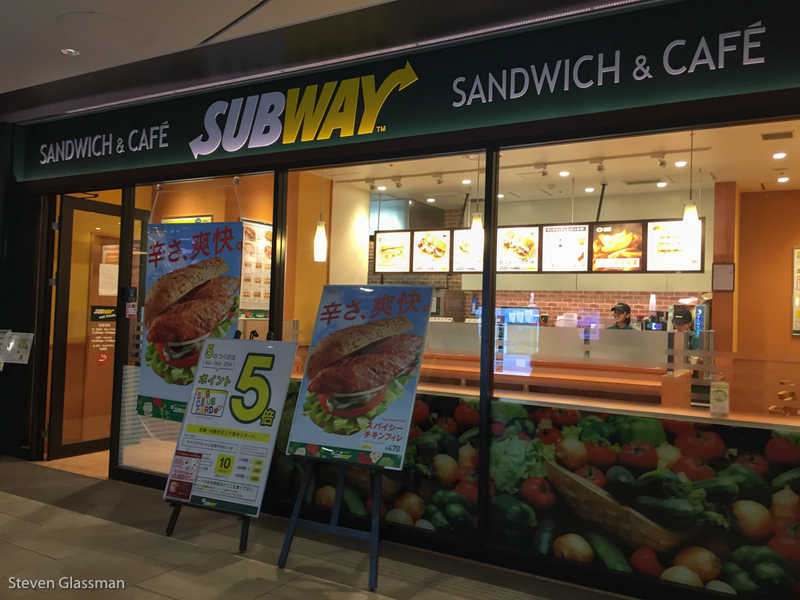 Have you ever eaten at a Subway restaurant away from your home country? Did you find it to be similar or different to your expectations? A brief aside regarding Japanese toilets. The next logical question then is why does it have little cartoony chickens on the packet? 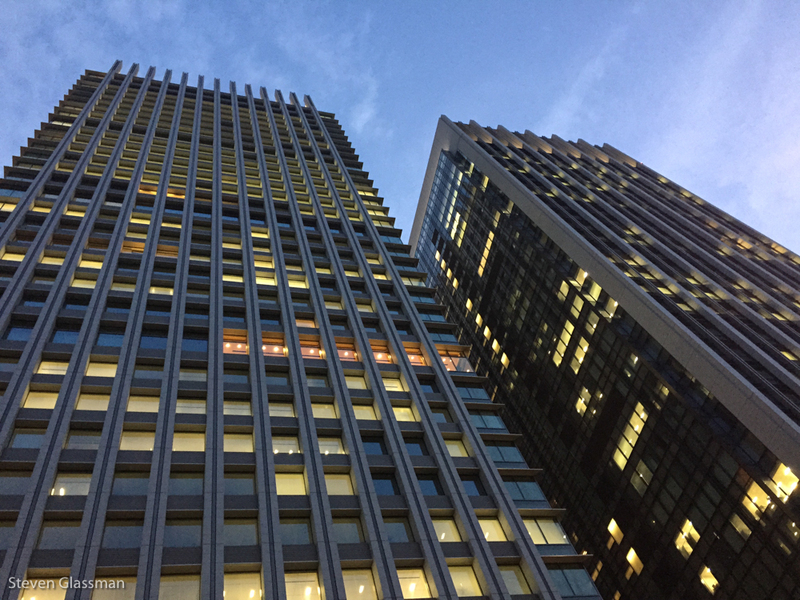 Pingback: Tokyo’s Tallest, or Getting High In Japan | Sunshine. Whimsy. Tacos.